This is a perfect lunch box recipe packed with vegetables and corn. The presence of corn adds that extra bite to the rice making it more flavourful and delicious. If the veggies are cut and ready then it takes just about 15 minutes to cook. This is the easiest way of eating vegetables which you don’t normally like to eat. First chop the vegetables, tomatoes and onions into small pieces and set aside. Then heat oil in a pressure cooker, add onions, cardamom and cinnamon and sauté till onions turn golden. Then add garlic paste, ginger paste, chopped tomatoes, coriander leaves, red chilli powder, garam masala and salt. Mix well and cook till oil starts separating. Then add the vegetables and corn. Cook for about 2 minutes. Then add the drained rice, cook for a minute, then add water, close the lid and pressure cook for 10 minutes or up to 3 whistles. Serve hot. It can be had with meat balls, shami, cutlets or sauce. 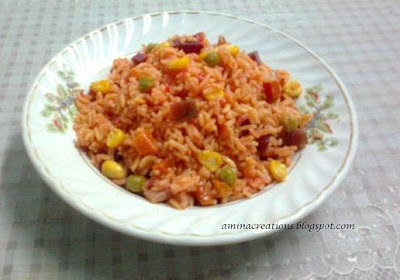 Delicious n simple recipe of rice..love those corns in it!! Rice looks colorful and delicious..u have a nice space Amina..thanks for visiting my space.,i dnt see a google connect to follow u ..lemme knw..
rice looks delicious, thanks for visiting my space, following u..u have a lovely space with wonderful posts.. Thank you for stooping by Experiments! Wow adding corn to the fried rice never crossed my mind, next time I've got to try adding corn to my fried rice. Corn gives a light crunch. Love it..